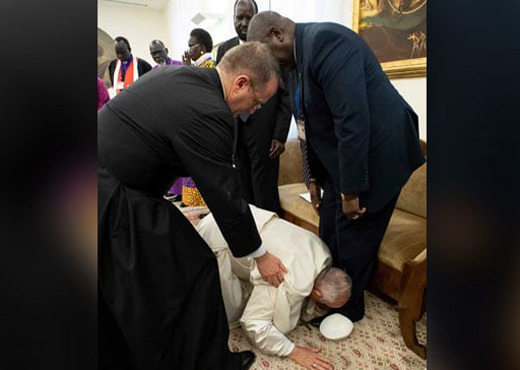 Vatican City, Apr 12, 2019 : Pope Francis, in a dramatic gesture after an unprecedented retreat at the Vatican, knelt to kiss the feet of South Sudan’s previously warring leaders on Thursday as he urged them to not return to a civil war, NDTV reported. "There will be struggles, disagreements among you but keep them within you, inside the office, so to speak," Francis said in Italian as an aide translated into English. "But in front of the people, hold hands united. So, as simple citizens, you will become fathers of the nation."